Spring is in the air, and that means the start of the golf tournament season. One of the things we do for golf tournaments is make the production of golf sponsor signs a breeze. 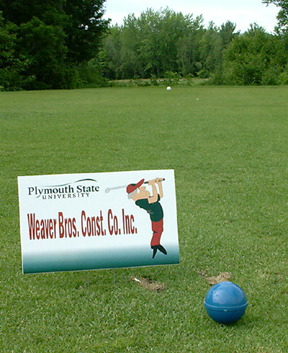 Send us the list of your tournament sponsors, and you’ll get back a box of sponsor signs ready to jab into the ground. Many people have told us that theses are the nicest golf sponsor signs they’ve ever seen. We print them on coroplast, which is plastic cardboard. They are waterproof, and durable. They come with a U shaped wire stake taped to the back, and they jab into the ground. Because they are small (10×17″), you can put them so they face the golfers as they tee off, instead of putting them at the side or back of the tee box. This actually gives the sponsors more exposure. After all, who looks backward when you are getting ready to tee off? What people like about them is that they are light and easy to deal with, you hop into a golf cart with the box of signs and away you go. Signs are up in no time. At the end of the tournament, you collect them and put them in a box for next year. You’ll only need to print signs for your new sponsors. This entry was posted in large format printing and tagged golf sponsor signs, golf tournament signs, green signs, tee sponsor signs. Bookmark the permalink.